I was having a cuppa tea with a Wise Woman this weekend when a Woodpecker decided to make himself known. He hung around the entire time and has now camped out at Wise Woman's. That doesn't surprise me a bit. 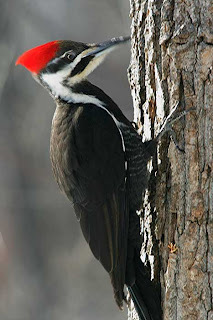 The Woodpecker, as a totem animal in Native American culture, is considered the most nurturing of all the animal signs. And Wise Woman is a natural nurturer. She has that maternal energy that has much more to do with a spiritual calling than with any physical, earthly, situation, experience or stage of life. In my opinion, the Woodpecker probably was just drawn to that kind of energy as a similar vibration and he feels pretty comfortable there. They are kindred spirits. As with all animal signs, there are lessons or messages that can be drawn from the appearance of a Woodpecker in your life. The Woodpecker is a drummer. He beats away at any tree, even dead wood.The drumming song is said to connect you to the heartbeat of the earth. Shamans have been known to use the Woodpeckers drumming to enter new dimensions or perform astral traveling rituals. "you're feeling trapped in emotional turmoil and you want to dig in and analyze what's going on so you can understand those feelings." Hmm... sounds kind of like why I was having that cuppa in the first place! The Woodpecker is said to stimulate new rhythms and reflect an awakening of new mental faculties. I guess the ultimate goal is to dislodge those bugs from your brain and bring them into your physicality. And perhaps, if it feels like you are "beating your head against a wall", you need to change the rhythm of your beat a bit, or move on to a different tree! The Woodpecker we saw has a brilliant red head. Apparently not all Woodpeckers do, but this guy was easily recognizable because of it. Red resonates with the Root Chakra and that basic survival, need to be nurtured, emotion. In my opinion, it's significant that it's the head of the Woodpecker that is red. He wears his red on the area of the body that more commonly corresponds to the Crown Chakra and our connection with the universe and our higher selves. It seems evidence that the Woodpecker is about pulling that higher knowing into your Root Chakra where you can act on it with a sense of purpose and find nurturing, basic, survival strength because of that connection. In my opinion, Woodpecker energy resonates with the Bach Flower essence Clematis. Clematis is a grounding essence. It is helpful when you are lost in your daydreams, in a world of your own, perhaps in your Crown Chakra. Clematis can help you bring those dreams, knowledge and creativity into reality. It can help you fulfill your potential by bringing your musings into action. Clematis can help you find that sense of purpose. In Sweet Shack & Bach Bar, http://www.brylerpublications.com/books/fiction/sweet-shack-and-bach-bar , Samantha found balanced grounding through Clematis. She left with red shoes, but maybe a red hat would have helped as well. Both Clematis and the Woodpecker can help you return to your natural rhythm and find your own way of being. By finding your own way you discover harmony and know you are on your way through straightforward action. You find the true connection of mind, body, and soul. March to the beat of your own drumming. today out the blue for the first time we noticed an unusual little creature on our bird table, he was absolutely gorgeous, i have never seen a woodpecker before,and he was amazing. we did some research on the internet that`s how we found out what this beautiful little animal was i do hope he returns, to our garden. OMG, I WAS IN MY TRUCK TODAY, AND I SAW THIS BEAUTIFUL BIRD WITH BRIGHT RED HAIR. I WAS SO EXCITED. I WATCHED HIM TILL HE FLEW AWAY. I WILL BE LOOKING FOR HIM OFTEN! Woodpecker at my bedroom window this morning, have never had that happen before, and here it is Mother's Day. He tapped on the house and then the window until I went outside. I 'randomly' clicked on the woodpecker photo that came up on my Google search and found this wonderful post. Your insights, even almost two years later, are poignant and touching. Thank you for helping me awaken to the dynamics heralded by the two woodpeckers I saw in my journeys today. Blessing, Beloved One. Ok, I just recently lost a childhood friend who did not survive his leukemia transplant. I messaged him the night before his treatment and that will be the last conversation I will ever have with him. I am devastated. I wanted the last couple of days some sort of sign that he is ok. This morning, two days after his death I sensed a strange shadow outside on our deck. I turned around and saw a pileated woodpecker landing on our deck. He was beautiful and large much like Jim was. I am reading this blog after my internet search and am feeling a healing in that this is my sign. Jim ok and wants me to live a good happy life and he is fine. I will just talk to him later some day. This post helped me today. I came across the animal for only the second time in my life, and he led me also to your wonderful work.